On March 14th, join Astro on Tap NYC for Pi Day and our celebration of Albert Einstein’s 139th birthday! We’ve teamed up with No. 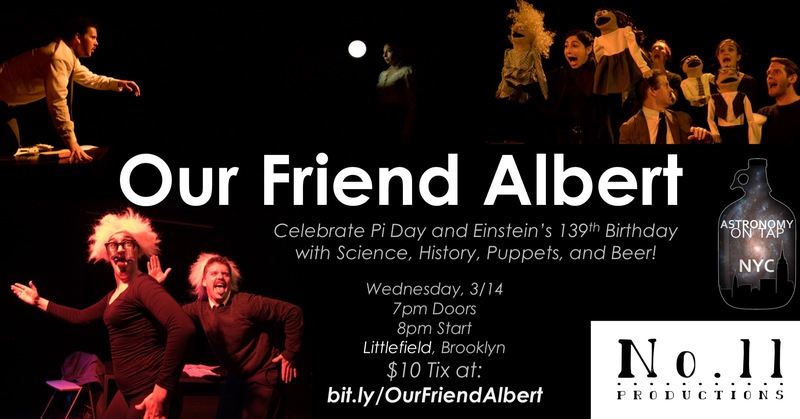 11 Productions to bring you snippets of the play Friends Call Me Albert paired with talks on the science and history of Einstein’s life and discoveries. It’s also our debut at Littlefield in Gowanus, Brooklyn. Tickets are only $10, and are on sale now. And RSVP and more info on our Facebook event page. Doors at 7pm with plenty of beer available and Einstein-themed merch from Startorialist! Show starts at 8pm, with even more Einstein-themed prizes at 10pm from the Unemployed Philosophers Guild! !